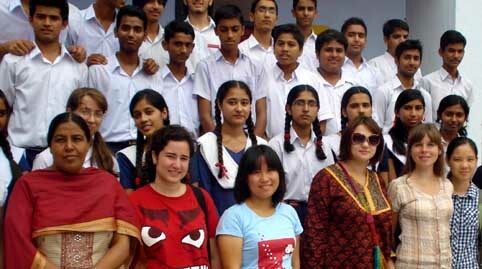 Twelve members of AIESEC visited Kendriya Vidyalaya Sector-31, Chandigarh on 25-Jul-2011 under the aegis of Indian Environmental Society’s Chandigarh centre. AIESEC (Association Internationale des Étudiants en Sciences Économiques et Commerciales) is a global youth organisation that develops leadership capabilities through their internal leadership programmes and engaging students and graduates in international student exchange and internship programmes for profit and non-profit organizations. They gave a presentation on Environmental issues and interacted with students on ways and means of conserving energy, environment. They emphasized judicious use of natural resources and utilizing alternative resources. The members who were from different countries viz. Russia, Ukraine, China, Turkey, Brazil & Egypt also shared their cultural background. There was a good interaction as the students were curious to know about their culture and education system, while interacting with Mrs S K Bhatia, Principal of the School they admitted that rich Indian culture and unity in diversity always attract them.